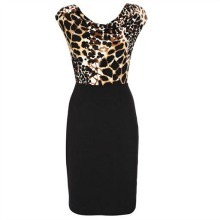 Channel the popular Animal print trend with this 2 in 1 dress. Featuring a fitted pencil skirt and feminine cowl neck top, this dress is perfect for on and off duty wear. Team with a pair of court shoes and simple jewellery for a chic look. Length is approx 93cm. 95% Polyester, 5% Elastane. Machine washable.